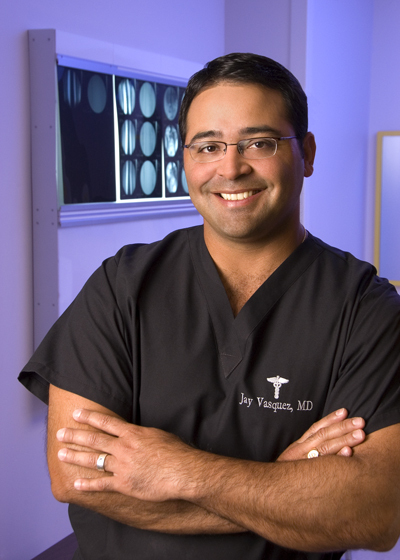 Dr. Vasquez sees patients at our Dallas and Plano clinic locations. Ron J. Hekier, M.D., Javier Vasquez, M.D., Thomas Taylor, M.D., et Al., “Intraoperative Enteroscopy to Identify Obscure Gastrointestinal Bleeding”, Presented at the 94th Annual Scientific Assembly of the Southern Medical Association, Orlando, Florida, November 3, 2000. Granchi, T., M.D., Schmittling, Z., M.D., Vasquez, J., M.D., Schreiber, M., M.D., Wall, M., M.D., “The Use of Anticoagulation is not Necessary When using Intravascular Stents”, Published abstract in the Proceedings of The 52nd Annual Meeting of the Southwest Surgical Society, pp. 16. Vasquez, J., M.D., Poultsides, G., M.D., Lorenzo, C., M.D., Foster, J., M.D., Drezner, A., M.D., Gallagher, J., M.D., “ Stent graft placement for Non-aneurysmal infrarenal rupture secondary to penetrating atheromatous ulceration”, Presented at the Program Directors of Vascular Surgery Meeting, Bethesda, Maryland, April 5, 2003. Vasquez, J., M.D., Gruenbaum, S., B.S., Drezner, A., M.D., “Multivariable Analysis of Open vs Endovascular Stent Graft Repair of Abdominal Aortic Aneurysms: Single institution 5 year experience”, Presented at the Hartford Hospital Summer Student Fellowship Research Forum, Hartford, CT, August 8, 2003. Jay Vasquez, Jr., MD, Shaun Gruenbaum, BS, James Gallagher, MD, Robert Lowe, MD, Phillip Allmendiner, MD, Michael Hallisey, MD, John E. Foster, M.D. A.David Drezner, MD, PhD: “Endovascular Stent Graft Repair of Abdominal Aortic Aneurysm: Is it a Better Alternative?” Presented at the Peripheral Vascular Surgery Society 14th Annual Winter Meeting, January 30, Steamboat Springs, CO.
Granchi, T., M.D., Schmittling, Z., M.D., Vasquez, J., M.D., Schreiber, M., M.D. Wall, M., M.D., “The Use of Anticoagulants is not Necessary When Using Intravascular Stents”, American Journal of Surgery, Vol. 80, No.6, pp. 453-457, 2000. Vasquez, J., M.D., Poultsides, G., M.D., Lorenzo, C., M.D., Foster, J., M.D., Drezner, A., M.D., Gallagher, J., M.D., “ Endovascular stent graft placement for non-aneurysmal infrarenal aortic rupture: A case report and review of the literature”, Journal of Vascular Surgery, October, 2003. Baylor University Medical Center Continuing Medical Education for Radiology Technician Program, “Endovascular AAA Repair”, October 22, 2004.